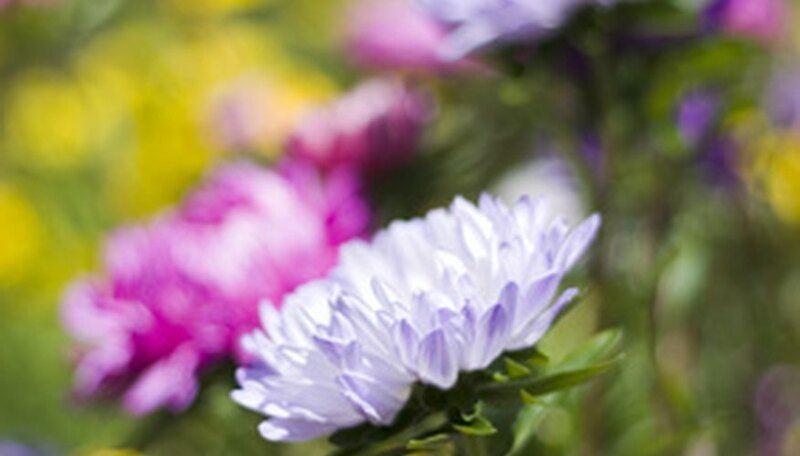 Springtime chrysanthemums are commonly called mums. 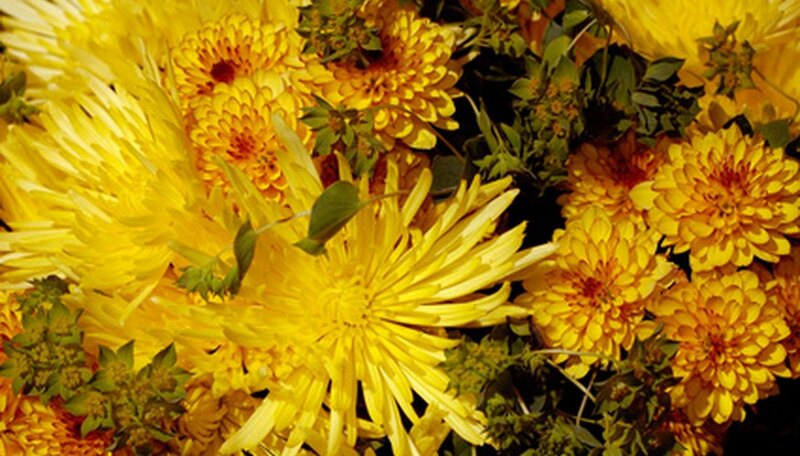 Mums are planted in the spring for the ideal summer and fall flower production. Plants produce a wide range of blossom colors such as yellow, pink, red, lavender and brilliant orange. Care must be taken to carefully pinch the plant's new shoots in May and June to avoid summertime legginess. Pinching makes a bushy plant that will produce ample fall blossoms. Plant spring garden mums in a sunny location. The site should offer well-drained soil. Plant mums a minimum of 18 inches apart for small dwarf varieties and a maximum of 36 inches apart for the larger, more vigorous growing mum cultivars. Keep the garden mums moist but not waterlogged. 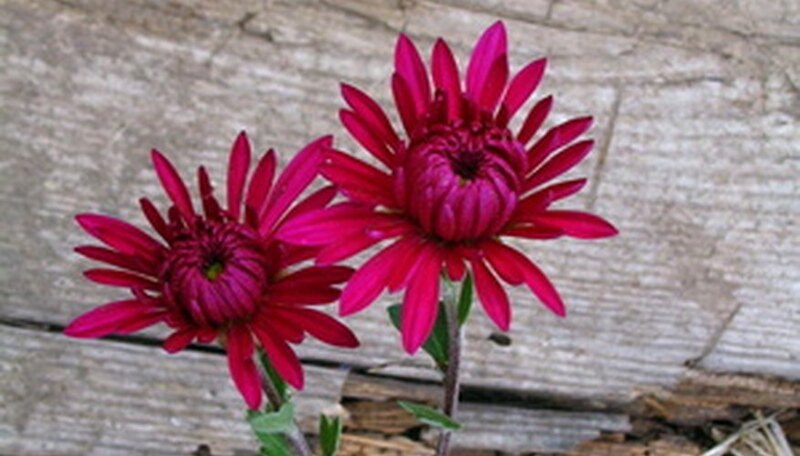 Fertilize mums once a month in May, June and July. Apply a basic granulated 5-10-10 or 5-20-20 fertilizer at a rate of 2 or 3 lbs. for every 100 feet square feet of garden mums. Water the fertilizer into the ground thoroughly. Do not fertilize after flower buds appear in late July because fertilizer will encourage the mum to produce more foliage instead of flowers. Pinching the new shoots of the mums is required to produce a bushy, attractive plant that is not leggy. When new growth appears simply pinch it off. Leave only two or three leaves on the shoot. Pinch the very end. Pinching should take place in May, June and July. Pinch each plant only once per month. 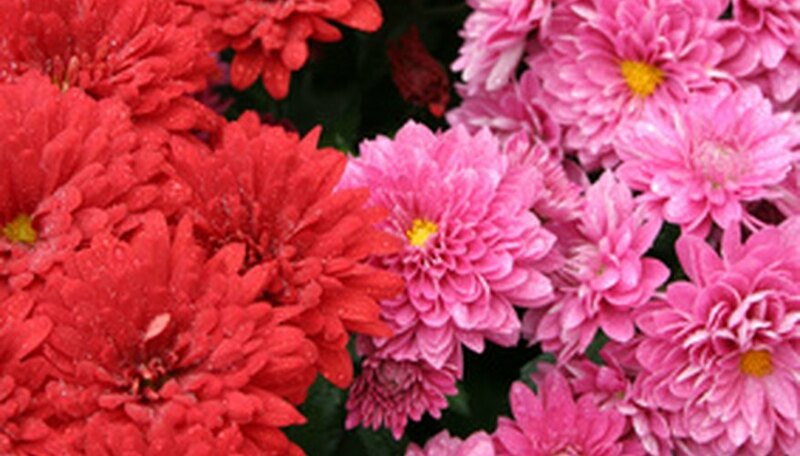 If the variety of mum is an early flower producer do not pinch in July or the new flower heads will be pinched. Pull weeds around mums as they appear so the weeds do to compete for light, nutrients and water. Mums enjoy a 2-inch layer of mulch over their root system to keep it cool and moist in the height of summer. Peat moss, saw dust, bark chips or recycled plastic mulches are ideal. Mums are highly pest and disease resistant. Aphids can be washed from new plant growth by applying a strong burst of water every few days until the aphids are controlled. White powdery mildew can often afflict the mums' foliage. The mildew appears as a white fungus growth. Purchase a fungicide powder for mums at a garden supply store and apply according to the directions on the label for control. Most gardeners consider the mum to be an annual so when the first hard frost kills the plant simply chop it off and discard. Till the root system into the ground using a hand trowel to add future nutrients to the soil. Mums that do survive to produce the following season tend to have poor flower production and often end up quite leggy.